People pay a lot of money for a restaurant table, hotel room or apartment with a good view, but prospect has it’s most dramatic effect as part of a sequence. The geographer Jay Appleton (1919-2015) famously advocated that people prefer views, scenes, paintings, and by implication, landscapes, in which there’s an element of both prospect and of refuge. We are programmed biologically to seek out places where we have a view, to identify the approach of danger (threats from predators), which at the same time provide somewhere to hide. Sheltering in a copse of trees on the side of a mountain might provide this, or it’s simulation as a view from a balcony. The hunter and the hunted also have high regard for scenes in which they see an opportunity for prospect: the sight of towers in the landscape, and places to shelter. Ten years after writing on his evolutionary-based prospect-refuge theory in The Experience of Landscape (1975) Appleton qualified his hypothesis in favour of movement rather than the static view: “Very often the balance that can be achieved from serial vision, involving the successive experiences of exposure to strongly contrasting landscape types, strong prospect then strong refuge, is more potent than that which comes from trying to achieve a balance all at once” (102). It’s as part of a sequence that the experience of prospects, refuges and hazards have their effect. But already in the 1960s, architects such as Gordon Cullen (1961-1994) knew the pictorial value of movement. It’s common to have our sense awoken by the sight of something unexpected, dramatic or spectacular, especially when on the move. Gordon Cullen’s alluring drawings of “cityscapes” in the 1960s show the progress of a pedestrian through a historic town. Cullen describes one such sequence: “The even progress of travel is illuminated by a series of sudden contrasts and so impact is made on the eye, bringing the plan to life (like nudging a man who is going to sleep in church)” (17). Such encounters keep us moving. Cullen speaks of a journey through Oxford that reveals “the unfolding drama of solid geometry. This is the unfolding of a mystery, the sense that as you press on more is revealed” (19). Around the same time Donald Appleyard, Kevin Lynch, and John R. Myer were studying the view from fast moving freeways: “in periods of wide scanning, attention regularly returns to the road itself. The only exceptions to this rule occur in those brief periods where the observer passes some important barrier and, being anxious to reorient himself, surveys a new landscape. This is the moment for visual revelations, when one is sure of an audience attentive to large effects” (6). The experience relates to a sudden demand on the driver’s attention. Here’s how they describe travelling across Manhattan: “Can any driver be ignorant of his passage under the George Washington Bridge, or his entrance into the Holland Tunnel? These are all opportunities for visual emphasis that will claim attention despite a normal state of distraction. The silhouette of an overpass, the texture of a retaining wall, the shape of a bridge column, guard rail or lamp standard are important events” (6). They provide a diagram of the experience, that I’ve redrawn here. The experience is prompted by transition from a confined route, to one of prospect: “Another striking feature is the importance of objects in axial view as the road comes out of confinement: the water tower, the Seagram’s sign, the Custom House tower” (36). The impressive prospect is also of other opportunities for prospect, iconic landmarks, with towers amongst them, even if inaccessible from the road. It seem to me that landscape, view, prospect, and place provide a range of effects, including awe, pleasure, delight, restoration, repose, and safety as well as disappointment, anxiety, danger and melancholy. But all this takes place in the context of movement and its attendant contrasts, either actual or implied. It’s also the sudden impact of such prospects that’s interesting. The effect may be fleeting, when as a hotel guest you walk on to the balcony for the first time and remark on the view, though pay it much less regard subsequently, unless showing it off to others. Appleton, Jay. 1984. Prospects and refuges re-visited. Landscape Journal, (3) 2, 91-103. See blog post by landscape architect J. Peter Monro: Our savored strolls seduce all our senses, in sequence, starting with seeing. 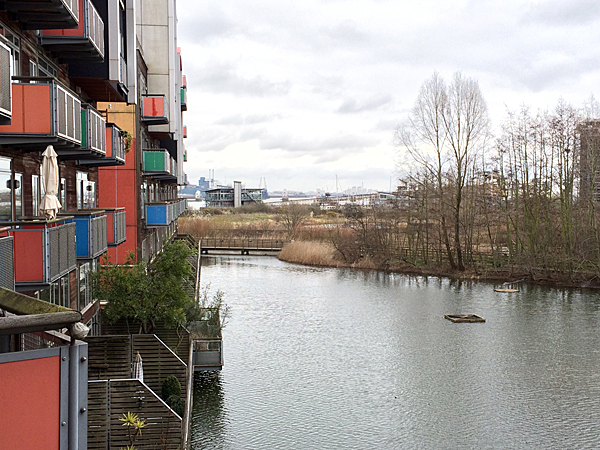 The first picture above is of the Greenwich Millennium Village by architect Ralph Erskine. Also see blog posts: Refuge, Aha moments, Turning the corner, Mood and movement, Moods and movies and Wet and wild. Appleyard, Lynch and Myer also describe a melancholy sequence experienced by a driver: “On rising to the crest, he expects some announcement: a view of the city, a new landmark, or a more vivid view of a previous goal. But the confinement of the dip is succeeded only by a bland and featureless horizon. Confinement and hiding, without equivalent visual intensity upon release, is a disappointment to the observer” (33). 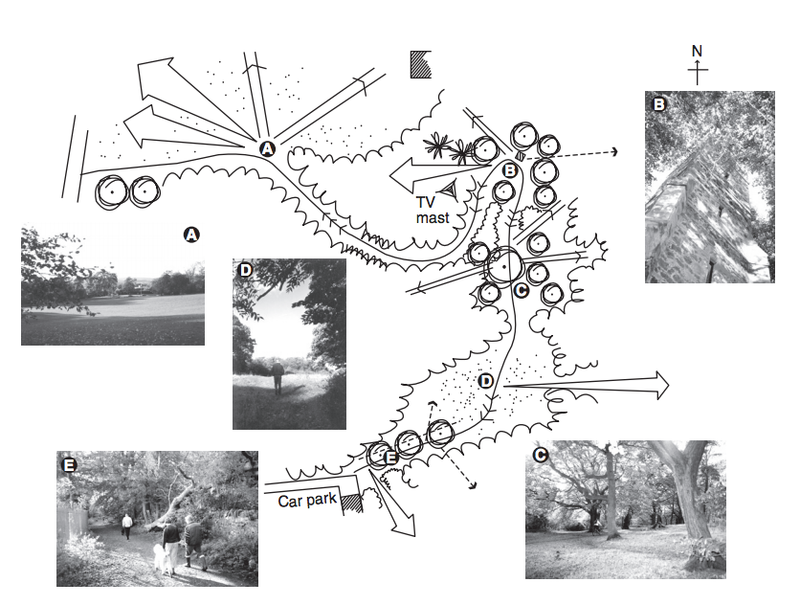 Catharine Ward Thompson and colleagues deployed a notation similar to that developed by Appleyard et al to examine the affordances of a landscape setting as experienced on foot. 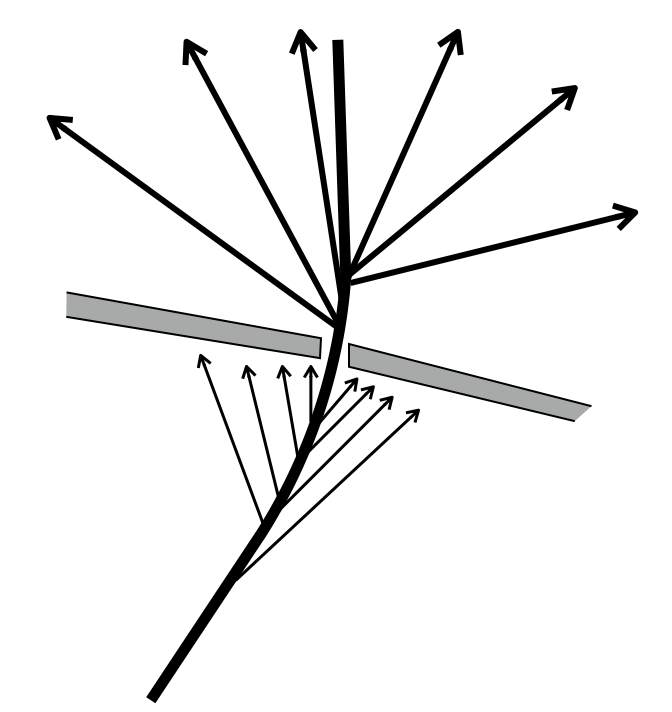 The following diagram is from their book (248). The map shows an enclosed path from B to A, opening up to a wide prospect at A. It’s captioned: Mapping the experience of walking through a wooded landscape in Drumchapel, Glasgow, in winter. I am not a great fan of Kevin Lynch’s ‘Image of the City’ but do like ‘The View from the Road’. In fact I rescued a copy of it, that the Minto House Library was throwing out ! So you know where to find a copy.